Forbes magazine ranked Salesforce as the Most Innovative Company in 2017. The reason: founded in 1999, Salesforce offers one-of-its-kind cloud-based customer relationship management (CRM) that enables businesses to streamline processes and enhance profits by minimizing the cost related to hardware management. Developers are increasingly leveraging Salesforce to create enterprise applications that offer world-class performance and reliability. In addition, Salesforce’s multi-tenant architecture enables organizations to optimize computing resources and drive significant gains in efficiency of applications. Salesforce can be easily integrated with NetSuite, the leading enterprise resource planning (ERP) solution, to expedite and enhance accuracy of data processes. While NetSuite offers an out of the box solution to integrate with Salesforce, many organizations’ data flow requirements are complex. Leveraging the capabilities of a trusted NetSuite-Salesforce integration partner can help you easily integrate customer information, product and price list, invoices, and payment history. This, in turn, helps create product opportunities and enhance sales. Salesforce also enables companies to customize products and opportunity line items, helping sales team to rapidly identify product availability and communicate with customers. Delivering superior customer experience is one of the few ways of achieving sustainable competitive advantage in today’s uber competitive markets. Salesforce’s Sales Cloud enables organizations to build close customer relationships by automating workflows and pricing approval processes to enhance sales effectiveness. In addition, real-time data analytics helps enhance decision-making and improve sales forecasting. By 2018, 20% of enterprises will deploy AI to make better decisions and provide real-time instructions, according to Forrester. Making strides in AI and analytics, Salesforce has helped its customers gain critical operational and sales insights, and rapidly explore data with AI - through Einstein Analytics. Leveraging Einstein Analytics helps businesses analyze billions of data points to generate predictive insights, unlock new opportunities, and turn their data insights into happy customers. Enabling businesses to create engaging and AI powered apps that are easy to deploy and scalable has further helped Salesforce turn the tables on its competition. 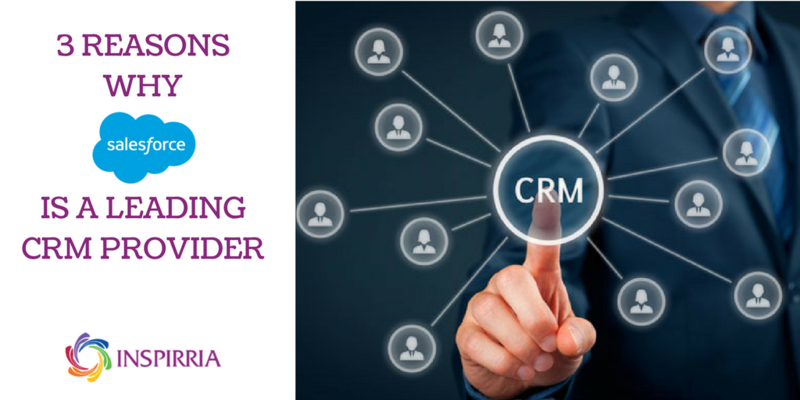 The world’s leading CRM helps clients manage and optimize their enterprise applications by integrating data, resulting in improved customer relationships – the number one competitive differentiator today. Inspirria Cloudtech is a leading Salesforce partner offering implementation services across Sales Cloud, Einstein Analytics, Service Cloud Lighting, platform and apps. We leverage our extensive global experience in cloud technologies to help companies drive sustained growth and business value.